So, there's this little book you may have heard a thing or two about.....the seemingly unstoppable force that is The Hunger Games (as well as the two books that came after it, of course). Basically, from the second I started to seriously pursue this dream of publishing a book, The Hunger Games has always been there- right outside of my field of vision, waiting. I've spent the last couple of years reading just about every YA title I could get my hands on (in my genre...because there's some YA that just doesn't appeal to me at all)--but NOT this book. It seemed like everybody in the world was telling me, "Oh Megan- you have to read The Hunger Games." And I put it on my shelf. And it stayed there. FOR MONTHS, PEOPLE. For whatever reason, The Hunger Games intimidated the crap out of me. I haven't heard a bad thing about it. Everyone who's read it is obsessed with it. Just like Twilight- except back when Twilight was hitting the shelves I wasn't trying to get published. But suddenly I was- and The Hunger Games represented this....insane thing that I would never be. Does that make sense at all? I was reading all the YA I could so I could learn from it, but I did NOT want to read The Hunger Games because I was afraid it would terrify me into never writing again. Like, what would be the point? Whatever I write could never be as good as The Hunger Games. So people would ask- "Have you read it? Have you read it?" And I'd just say something like, "Nah....haven't had time yet...."
And then....gradually....it stopped intimidating me. I picked up the book this morning and finished it in five hours. OH. MY. GEEZ. I'm like, seriously angry with myself for being so stupid about it all and not reading it in the first place. I'm also seriously angry that I didn't go on and buy books 2 and 3....because now I have to wait for them. And I think we can all agree that I hate waiting. I LOOOOOOOOOOOOOOOVE this book. 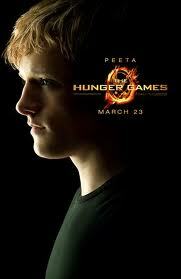 Team Peeta. All the way. Oh....Peeta. And you know what else? It didn't make me afraid of writing. If anything, it made me want to write. Because MAN ALIVE I love YA right now. I love that such amazing books- full of real drama and emotions, not preachy "Let's teach these teens an important lesson" stuff- are out there. When I think of how far YA has come since I was a teenager....(I mean, I loved the Sweet Valley High books and all--really, don't judge-- but come on). Now I'm going to go kill off several characters in my WIP. Suzanne Collins had been around the publishing block for quite a while, and had quite a team on her side before she wrote The Hunger Games. AND, The Hunger Games wasn't selling (like, at all) until Stephenie Meyer blurbed it on her blog. Then, and only then, did it take off. My point is this: That kind of behemoth doesn't happen easily, or even on purpose. A lot of stars aligned to make that series happen the way it did, and if you don't write your own Hunger Games... it has nothing to do with you or your talent. OH Gina. You are fabulous. I'm glad we're friends. I didn't know any of that about The Hunger Games. Seriously, I truly avoided learning anything about the book. Today was the first major breakthrough when I finally let myself read it! :) But wow- with what you've told me in mind- the whole subjectiveness of this entire industry amazes me. I'm glad Stephanie Meyer blurbed it then. It deserves to be big. It makes sense in a way to be intimidated by something that is quite as powerful as the first book in The Hunger Games series. The other two books are much less intimidating, and have some pretty big flaws, but they are still amazing in the end. Personally I was afraid to read them at first because I thought that they wouldn't live up to the hype (like Girl with the Dragon Tattoo or Twilight didn't live up to the hype for me). I was also pissed off I hadn't read them earlier and after I was done went and pumped out a significant amount on my WIP. I've avoided reading about it because I kind of dislike reading things that are hyped up in a major way. Still haven't read it.